“Jing Mai Shan” – Jing Mai Mountains – is undoubtedly the place that not only made us like China (or would we rather say the Yunnan Province), but also our trip, the Chinese people and a lot more. 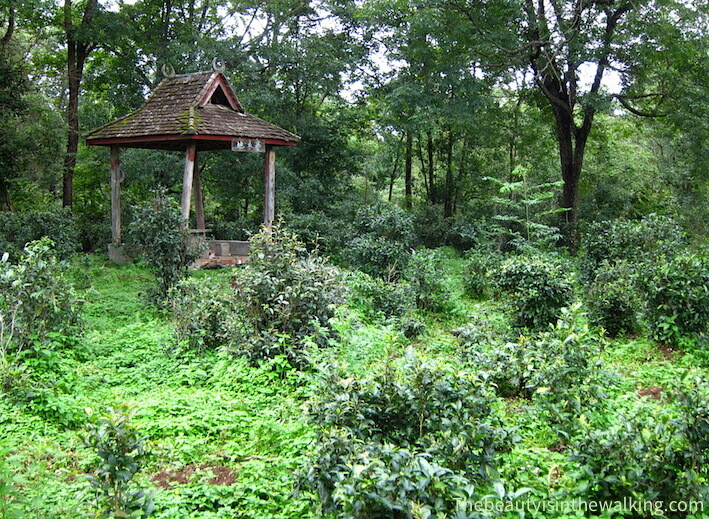 Jing Mai Shan is located in the district of Pu’er (South of Yunnan), which is famous in the Western countries for its fermented tea of the same name. 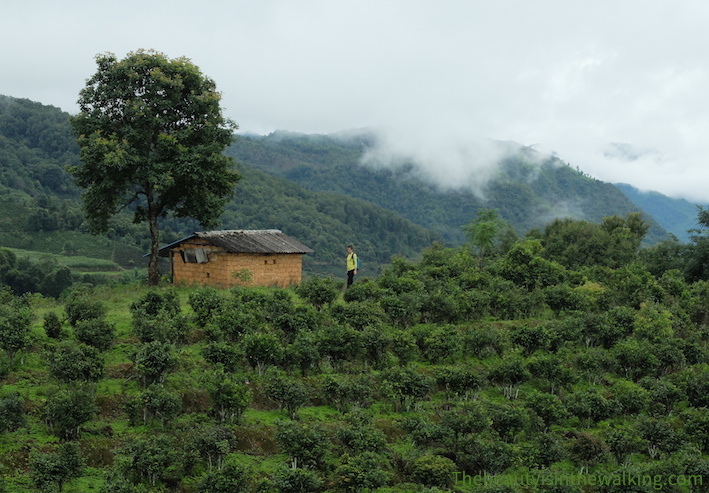 It was impossible for us not to stop off there and wander in the tea gardens, especially because it’s on this particular mountain that the most ancient tea trees of China grow. We have just come from Jinghong in the district of Xishuanbanna (Southern neighbouring district). And after a walk under a true downpour with trash bags on, a good wringing of our unique pair of shoes on the bus park, four hours in a local minibus, a night in Lancang and then a few hours spent at the bus station trying to take a bus going somewhere we don’t know much about, we finally show up at 10:40 am with a ticket to景迈 (Jing Mai). At Lancang bus station, people are staring at us from head to toe, a bit dumbstruck. They are curious but discreet. We are the centre of everybody’s attention. We are experimenting the bizarre sensation of being foreigners, and moreover physically different. Interesting. 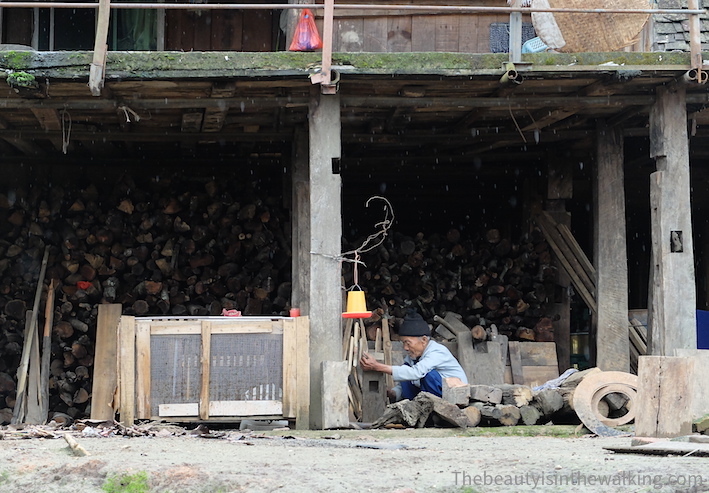 On the Jing Mai Mountain, two ethnic communities live: the Dai and the Balang. 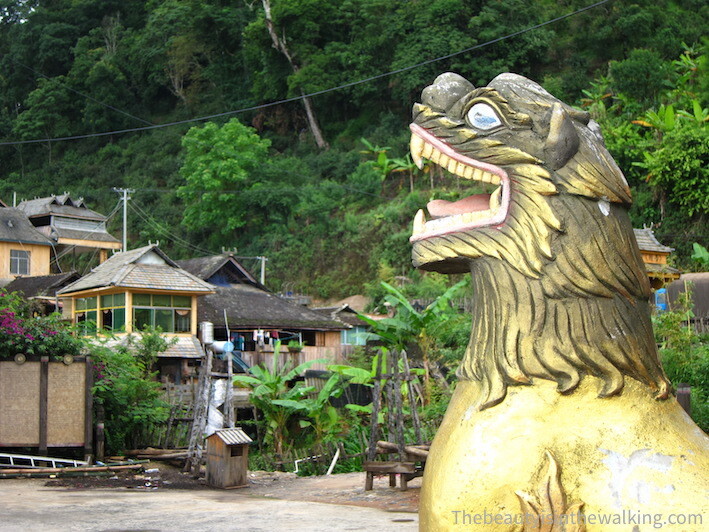 The Northern part is Dai land and the main village is… Jing Mai (Oh! That’s what it is…). 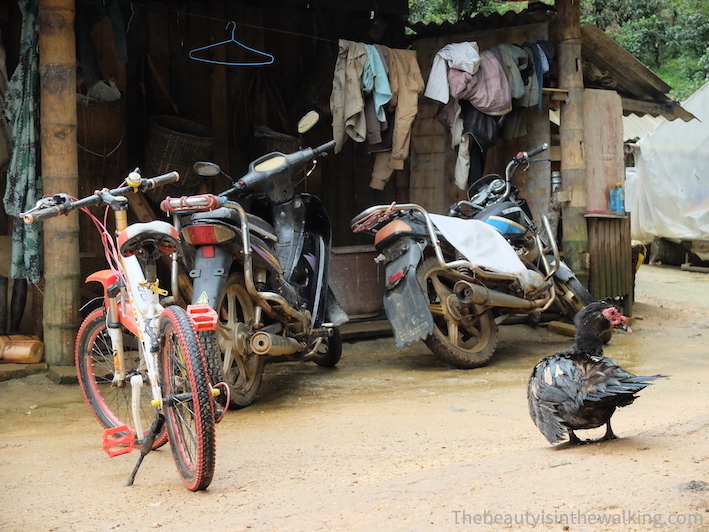 In the Southern part, where the main village is Mangjing, the Balang people live. They were the first to settle on the mountain 1300 years ago and to grow tea. 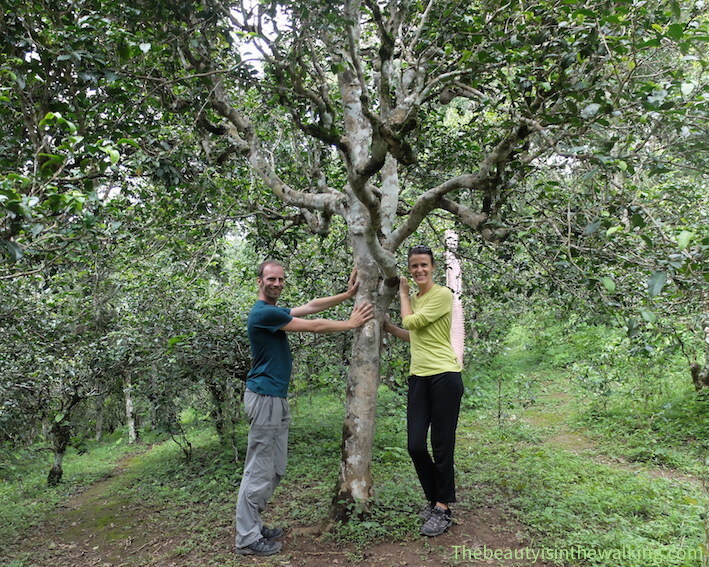 So, here grow the most ancient tea trees of China – and some are more than a thousand years old! – in the Da Ping Zhang (大平掌) tea garden. This garden is located on the plateau of the main mountain, at about 1600 meters high (5250 ft.). 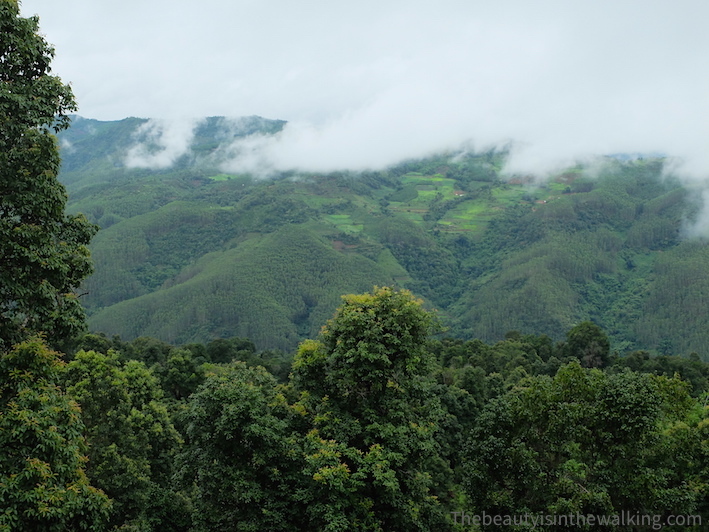 The other gardens with younger trees grow on mean slopes between 1100 and 1700 meters high (3600 to 5600 ft.). No one speaks good English but everyone is willing to try to communicate, even one of the rare Chinese clients who can speak a few words is called for help. We spent the whole morning there in a very pleasant and relaxed atmosphere. Those people are really lovely people. It’s now 12:30 pm and we have lunch at the hotel restaurant: egg and tea leaves, fried rice with a green vegetable soup. Then, again, they offer us tea. We taste many different kinds: red tea (fermented tea), green tea (raw tea), white tea, oolong tea (10% fermented) and black tea, but the first two only are Pu’er teas. Tea tasting requires preparing tea methodically with the help of a few items that must be handled with precise and harmonious gestures. 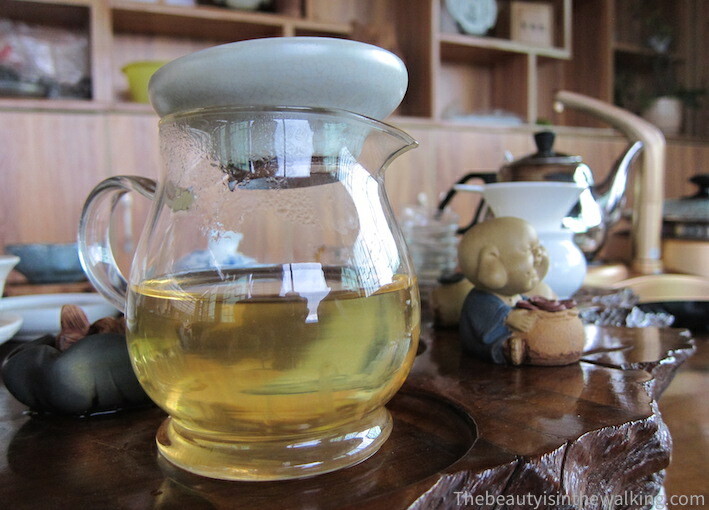 Gōngfū means “the art of doing things with diligence” and chá means “tea”. The tea tray (or table), on which we prepare and serve tea, is the object that draws the attention in the first place. This is an important piece in the whole process, and it appears to be a sign of wealth and refinement. It is more or less sophisticated. The ones we saw were carved in solid wood, that varies in size, species and the way it is sculpted. Some of them were such fine works of art! They all have a draining system that enables to throw away the first brew used to wash the tea and the utensils (And to think that we drink the wash water!). On this tray, one places a bowl with a lid (gaiwan) that serves for washing and brewing tea, a pitcher (or Cháhǎi) with a filter in which we pour the tea just brewed so that it can be served, and small cups, often transparent for tasting. We can also find a water kettle, tongs to handle the cups, a towel to wipe the items during the service, and small figurines used for decoration, that we water with the tea from time to time as a gesture of reverence. The gōngfū chá praises elegance, respect and slowness. So, for example you must bend your wrist to serve, firmly hold the brewing bowl with two fingers only, empty the cups after rinsing with a precise and accurate gesture, or even slightly lift your little finger while tasting. It’s an art in itself! We still have only one idea in mind: go and pay a visit to those thousand year-old tea trees and the villages where people have grown them for generations. But nothing is made to help Westerners visit the region, and we realise we ought to have rented a car with a driver before coming over to this out of the world place. Let me tell you that everyone seems surprised that we did manage to get there. 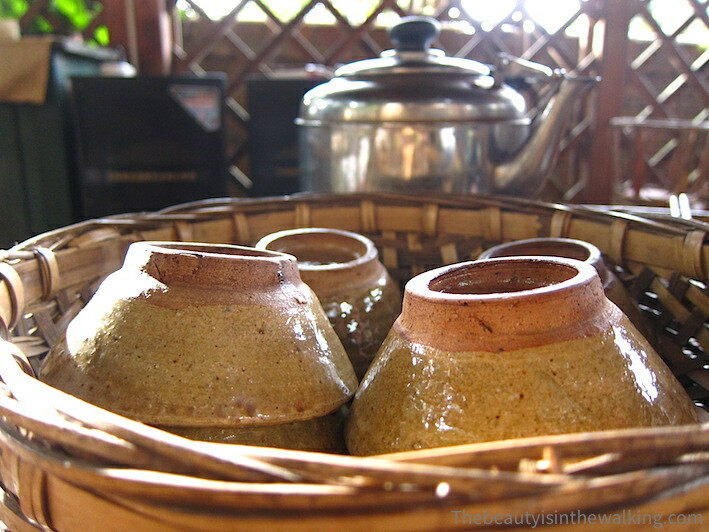 Pu’er tea has become popular in China and tourism is growing in this region. The government has applied for a UNESCO certification to protect the Mountain – and it is being assessed. In the meantime, a few infrastructures exist. Several big houses that grow and process tea offer accommodation and sell their products in a nearby store. At the moment, there are not so many visitors, and that was lucky for us. Lost but happy! So Luo Yuan, one of the young women of the hotel takes us under her wing because she speaks a bit of English. 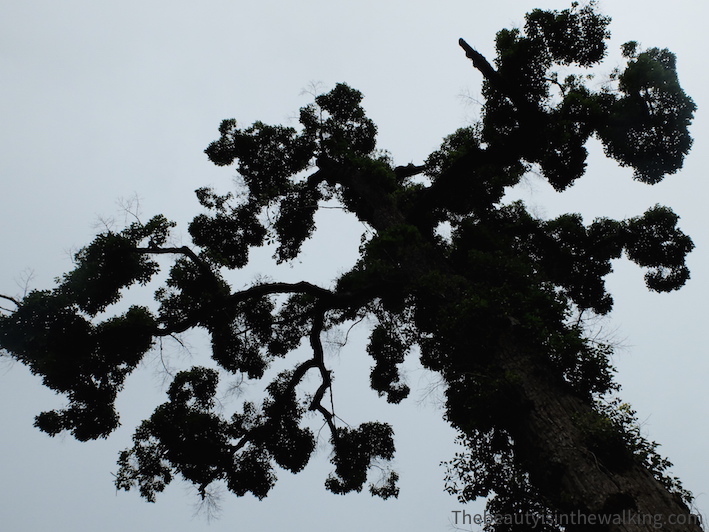 The communication remains difficult but it is our only hope to know more about the tea trees. Normally, one has to stay at the hotel to have the privilege to get a free tour of the gardens – even if we offer to pay for the tour. But finally, Luo’s boss allows her to be our guide for the afternoon. We’re so pleased! 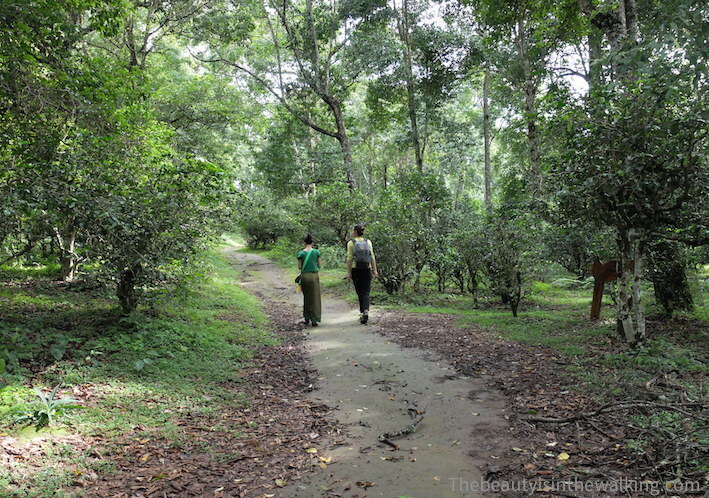 We enter the ancient tea garden that spreads over 730 hectares (1804 acres). This is common land and every villager can farm a piece of it. The part that can be visited has been recently protected: from now on, no car can park inside the garden. 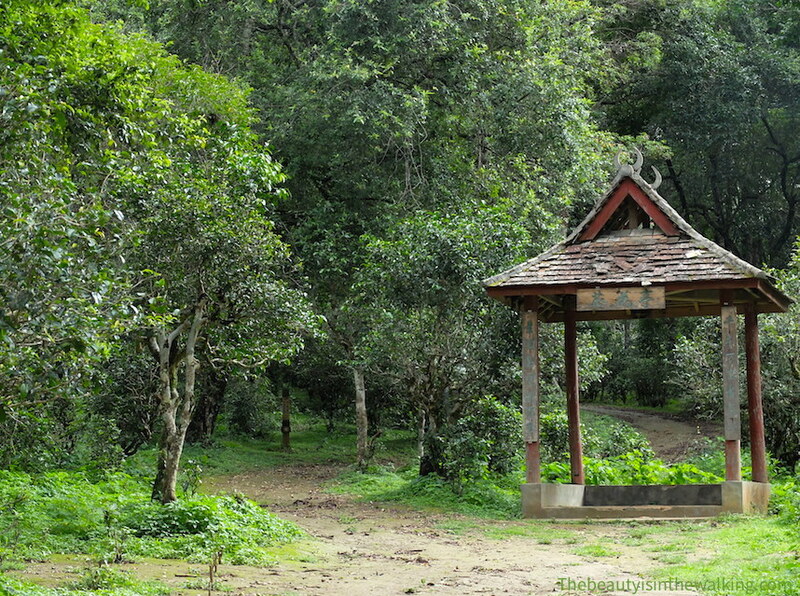 On each side of the paved road that crosses the garden stands a crowd of tea trees of various sizes growing together with other trees, some of them gigantic, as well as other low vegetation, and sheltering all sorts of bugs. 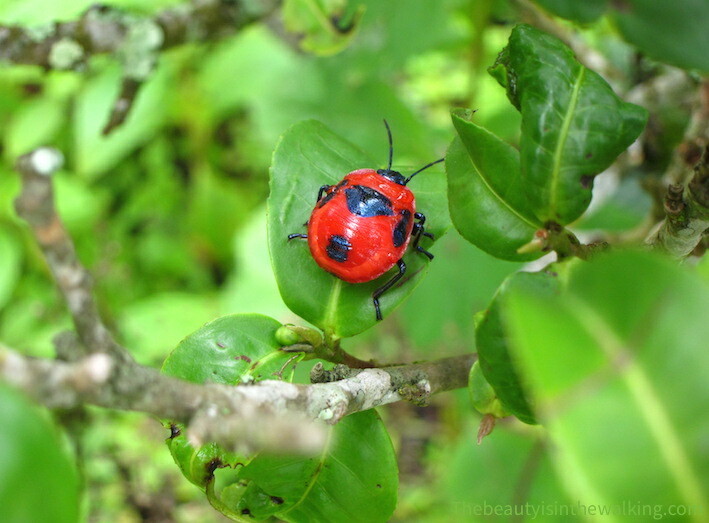 Well, an amazing biodiversity, which is very important for tea farming. Small wooden shelters stand here and there for the gatherers in case of a shower. “This tea tree must be a thousand years old”, Luo says. “And the oldest one is 1800 years old”. There might even be older ones! 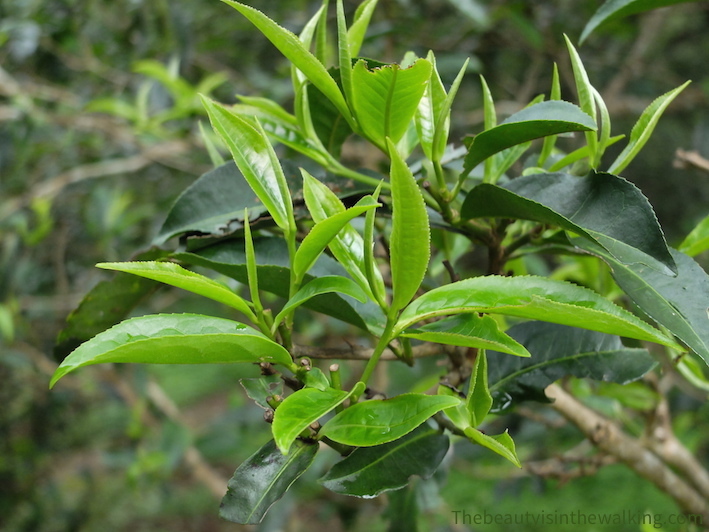 Tea trees are harvested twice a year, in spring and autumn. 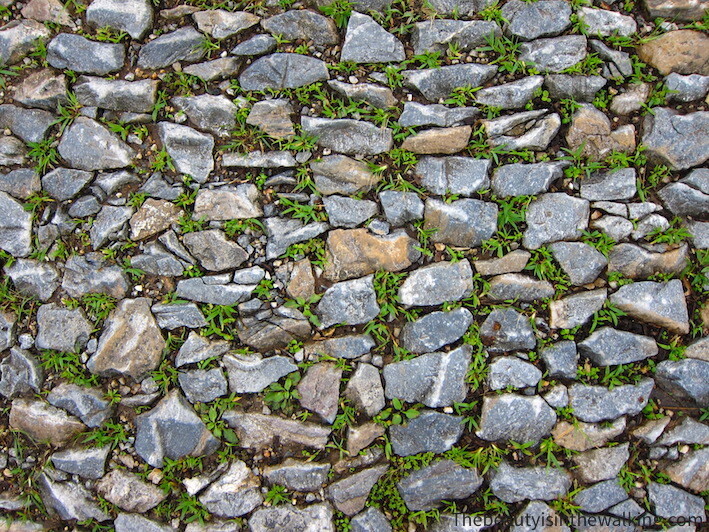 One picks the young leaves, the ones that are light-green. 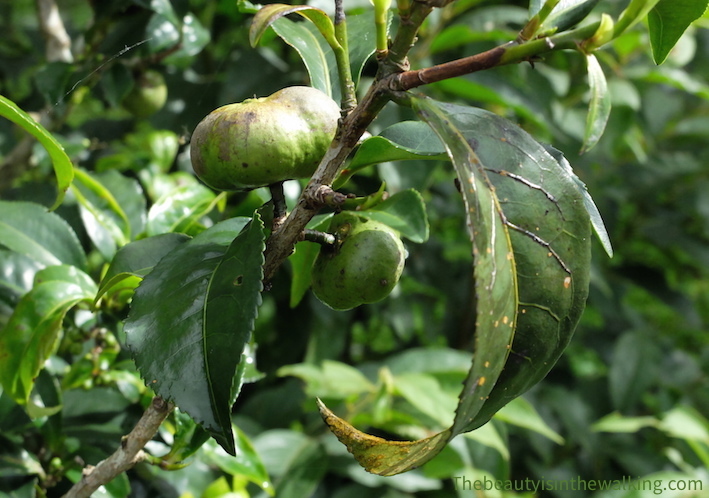 At this period of the year, tea trees have mainly large dark green leaves, and some fruits that contain a seed. During the blooming season, white flowers appear. Incidentally, some of them are picked and dried to be used as herbal tea. 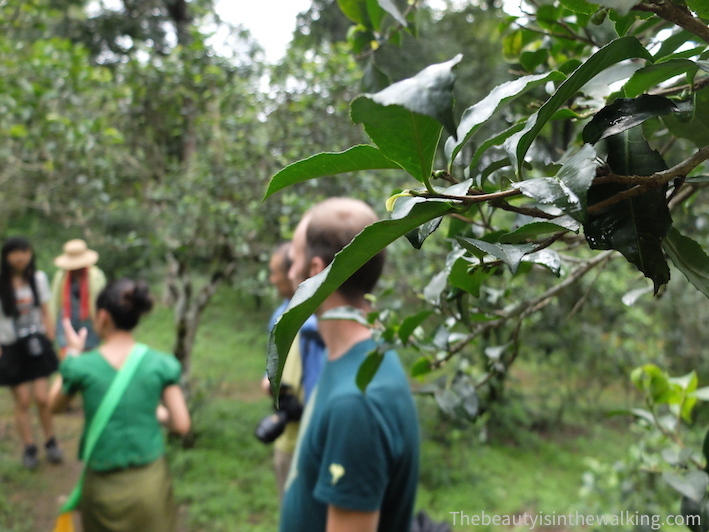 Luo Yuan takes us to see the « king » of the tea trees. This is one of the oldest in the garden. 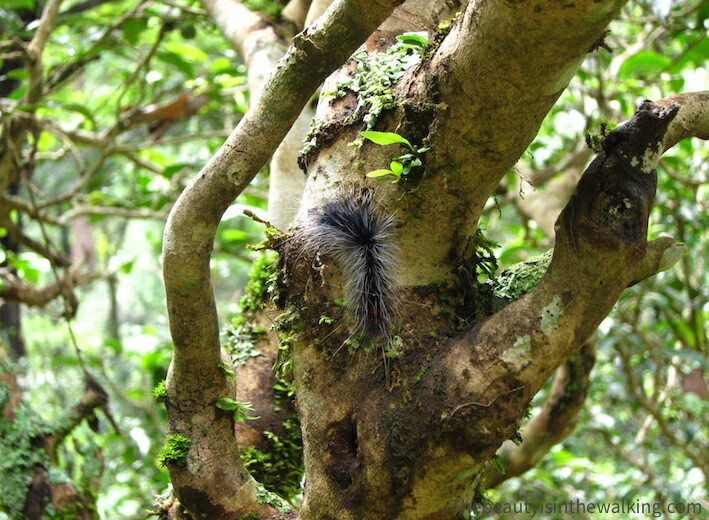 It is huge and it is rare – tee trees are usually kept small to facilitate harvesting. 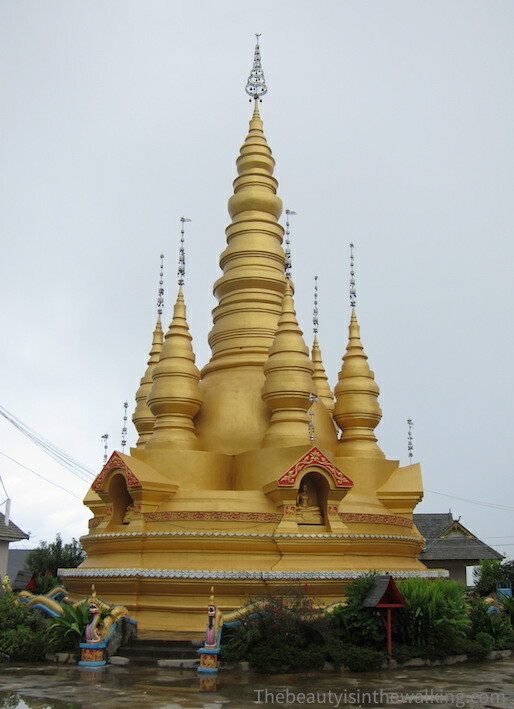 The villagers worship it and come here each year to pray. “The tree blesses you”, she says. Then we meet Anna and her family, who also came here to visit the garden. Here again, they came to us out of curiosity. They are from Kunming, the Yunnan’s capital, situated further up North. Anna studied in Vancouver for a year. She is smart and chatty. And above all… she speaks very good English. We talk avidly. She knew nothing about « her » region until her host family in Canada – tea lovers – asked her thousands of questions. Back for the holidays, she decided to learn more about it. Her uncle is a connoisseur; he has even tasted a 50 year-old tea. Before that time, no one knew the real value of tea and producers didn’t keep any stock. 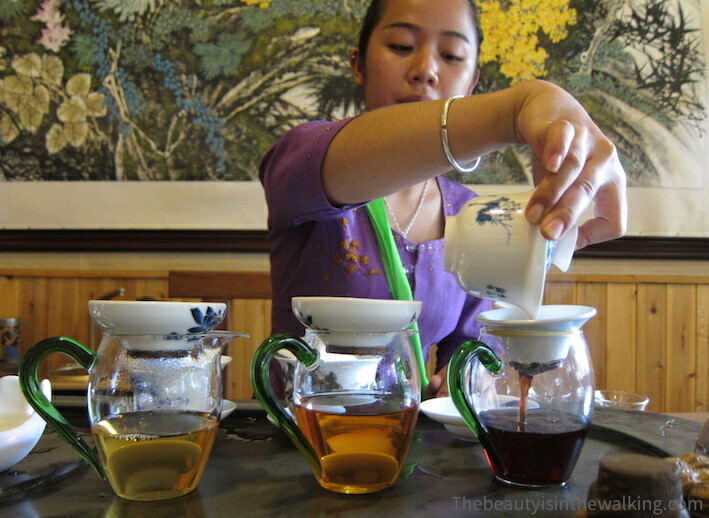 Pu’er tea has become popular in China as people have started taking an interest in its virtues. 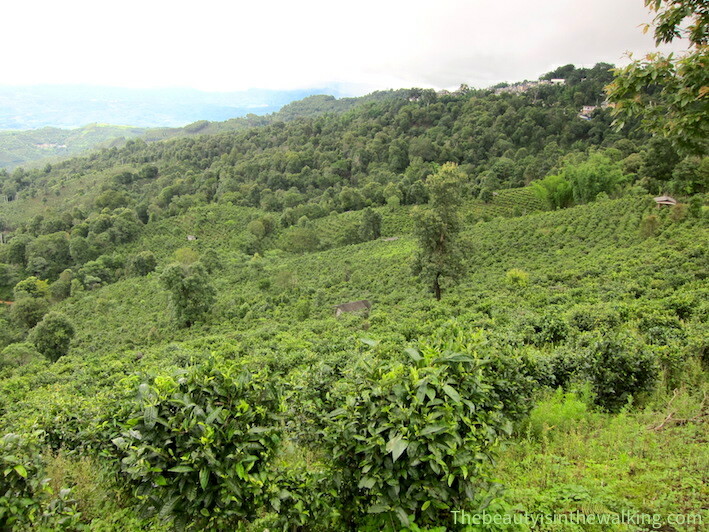 Now, the producers of Jing Mai Shan sell their production throughout China as well as abroad. 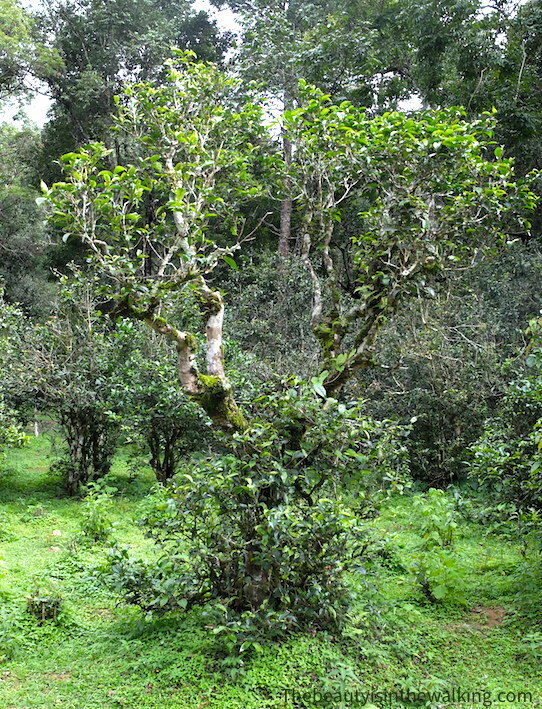 Their teas are famous, not only because some tea trees are very old but also because the tea is of excellent quality. Apparently, its taste varies from a hill to another. And it can be very expensive. 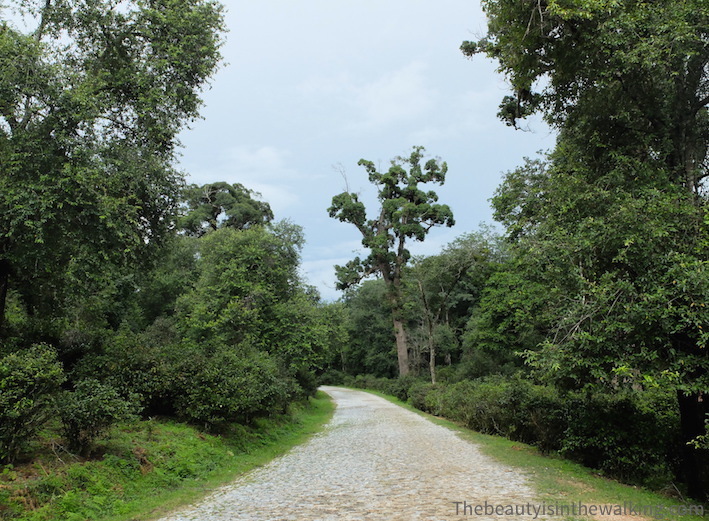 When the tea comes from the youngest tea trees – 200 years old… –, it costs around 600 yuans a kilo, and when it comes from the ancient tea trees, it can cost up to 1000 yuans a kilo. We can also blend different teas from various years. All in all, it is a bit like wine. Someone from the hotel comes round to pick us up by the end of the afternoon: we will have dinner there as we did for lunch. 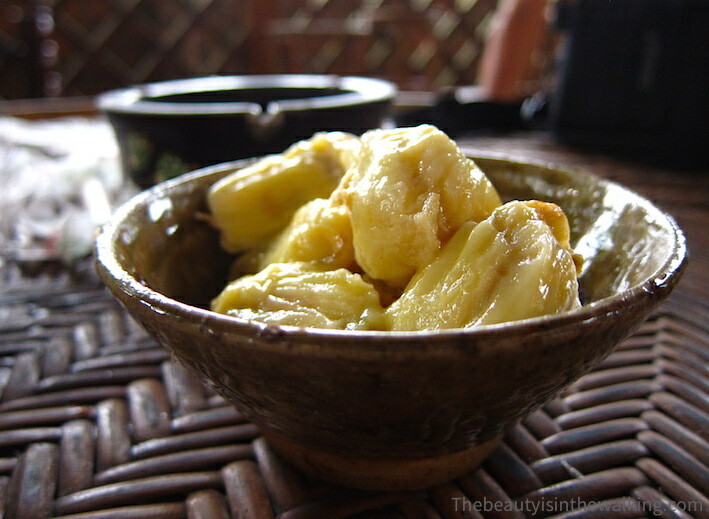 While waiting for the meal, we are having some fresh pieces of jack fruit with… tea. And then, a wonderful dinner: minced beef with tea leaves, brown rice cooked in tea, Omelette with tea leaves, cabbage soup and “local wine” – understand rice alcohol. We hadn’t had one that fruity and delicious before, but still it was… strong. At the end of the evening, the girls from the hotel perform a nice traditional dance. We meet again Anna and her family, who are staying at the hotel: “We said to ourselves that you were very brave to come to such a remote place by yourselves”, Anna ends up saying. The weather changes quickly at this time of the year, and it is raining the next morning. 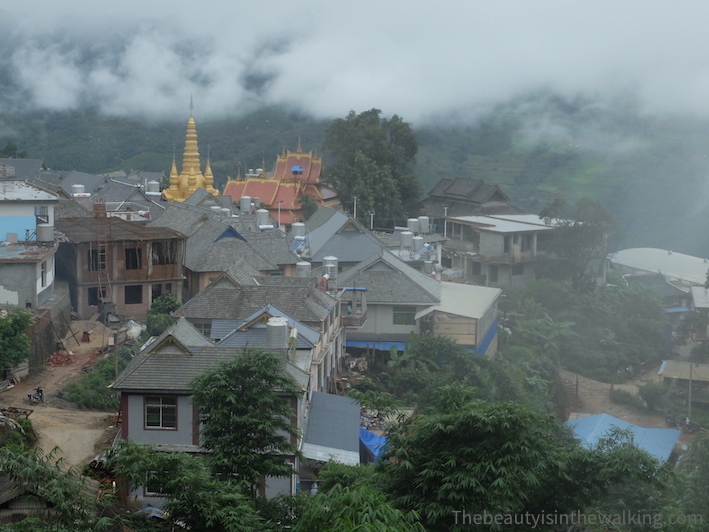 Around noon, the sky clears up and we walk up to Jing Mai Village. It is not the harvesting season yet but still we would like to know how tea is processed. In this village, two people still do hand processing, and this is precisely what is of interest for us. 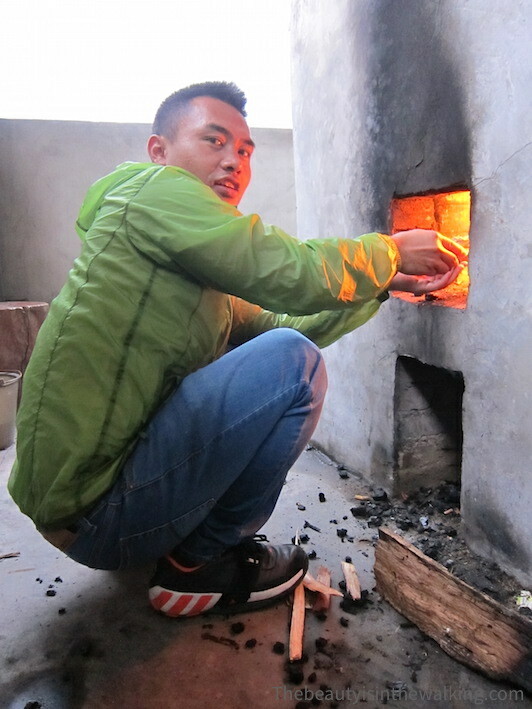 What we have in mind is to locate Ai Zai Yi, a young tea producer whose name we found on the Internet, so that he could explain how he works. We have no address but the village is small after all. After a first unsuccessful attempt, a young woman takes us to his house. Ai Zai Yi welcomes us with a large smile, and quickly invites us to come and see him working the same evening at seven o’clock. It’s 4:00 pm, so we have some free time but finally, we won’t leave his place before 10:30 pm. 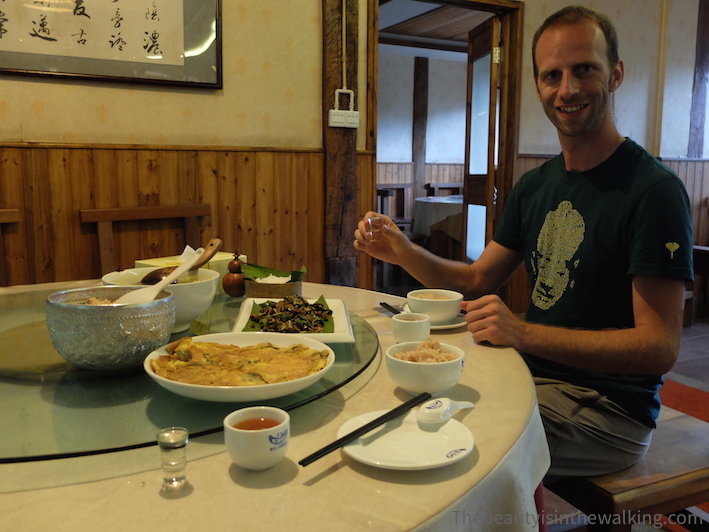 And he was actually surprised that we wouldn’t stay for the night… Such is the sense of hospitality of the Dai people! 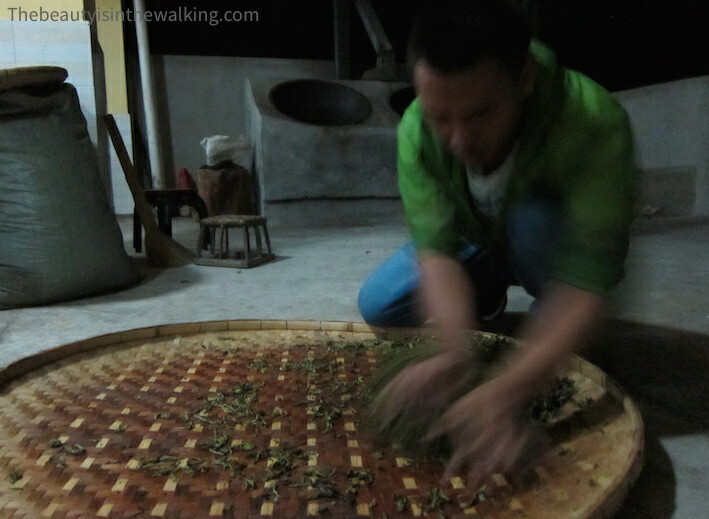 We were actually encouraged to tasting red and green teas, then he invited us for dinner, before another tea tasting, and then we helped him to process the tea leaves harvested earlier in the day: a Pu’er Sheng cha, in other words a raw green tea. 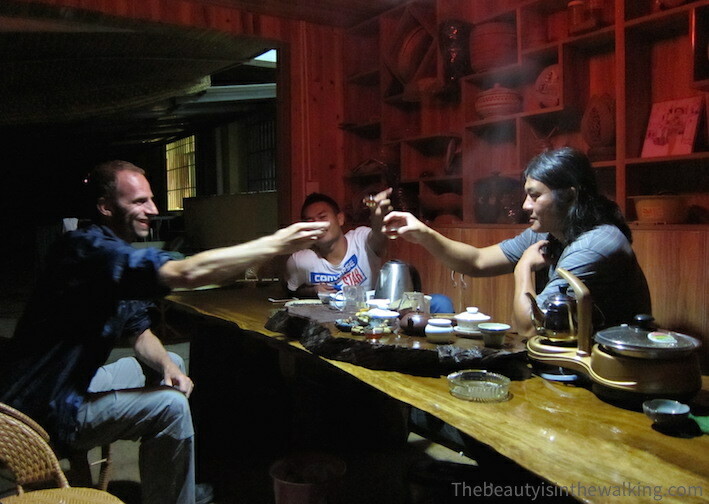 We ended the evening with tasting a wonderful fermented pu’er. Ai Zai Yi lights the fire under the cauldron. 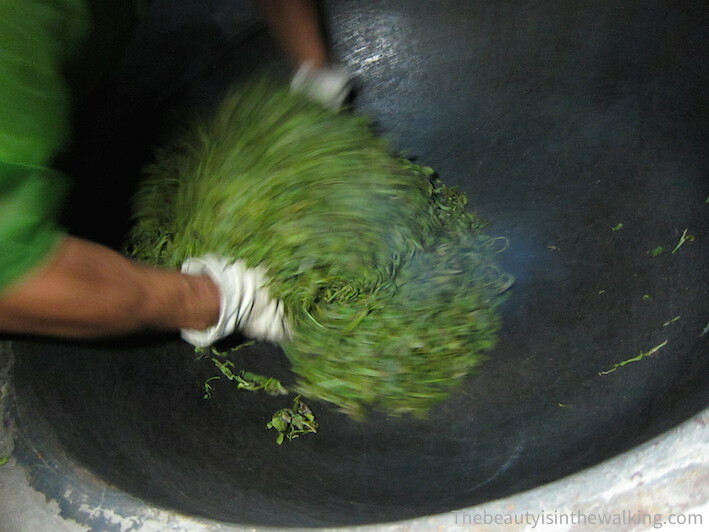 Once the cauldron has reached the right temperature, the freshly harvested tea leaves are put in the hot water and mixed by hand for half an hour with a particular technique. It consists in removing the water from the leaves to stop any fermentation process that could occur during drying. 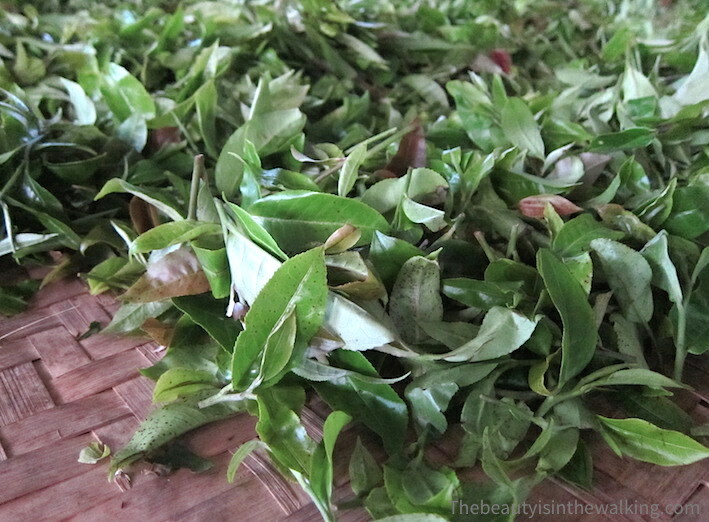 At this stage, the leaves shouldn’t be cooked or burnt, otherwise the tea will have a roasted or burnt taste. All along the process, Ai Zai Yi controls the smell, the colour of the leaves and adapts his gesture to the advance of the process. The heated leaves smell divinely good! 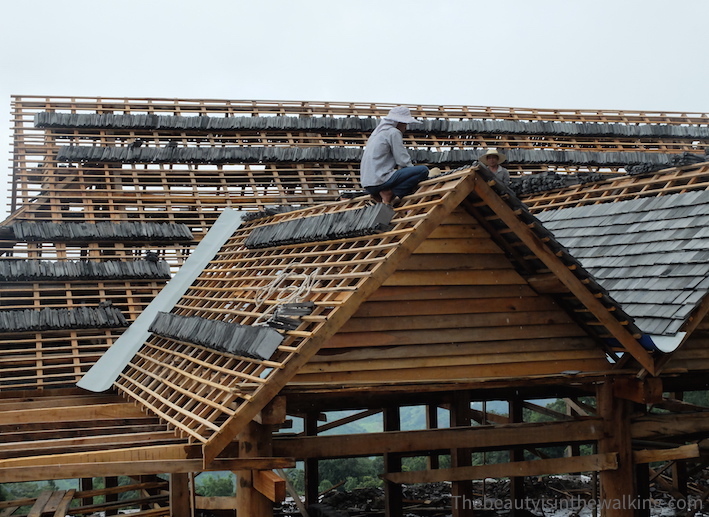 Once the whole process is finished, the leaves are spread on a flat bamboo basket where they are alternatively rolled-pressed with the right knack and aired for around 10 minutes. 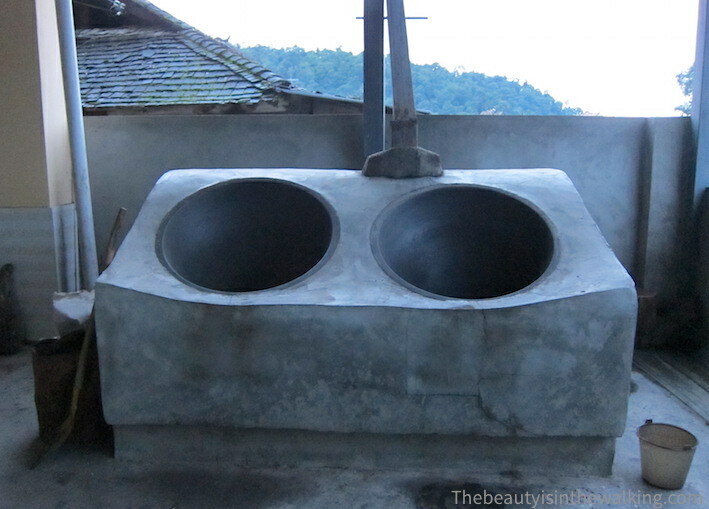 It enables them to cool down and it gives them the typical shape of hand processing. 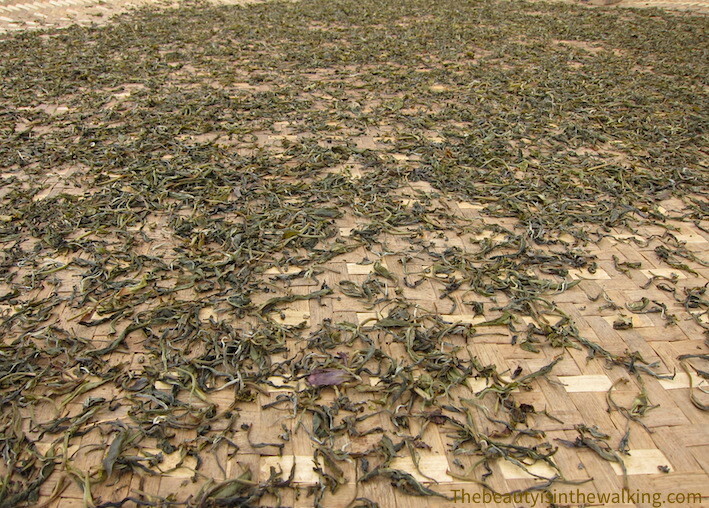 The leaves are finally spread on a bamboo mat for the drying stage. Ai Zai Yi invites us to stay at his place the night after. So we decide to extend our stay for one more day in order to honour his invitation and enjoy some more time and conversation with him. He wants to improve his English, which is not very fluent but just good enough to have a bit of a conversation. So he takes every opportunity to speak when he meets foreigners. He even has a notebook where he writes down the new words he learns and he watches language TV programs on the Internet. We spend the evening chatting in English, encouraged by a few Chinese beers. Our host lives in a big house located up in the village with his wife and young son, as well as both his parents. He started a tea business a few years ago with his associate. It seems to go quite well but they don’t mind working long hours. To reach Jin Mai Shan, you can take a direct bus from Lancang bus station or from the nearest small town, which is Hui Min (knowing that the Lancang bus stops at Hui Min). 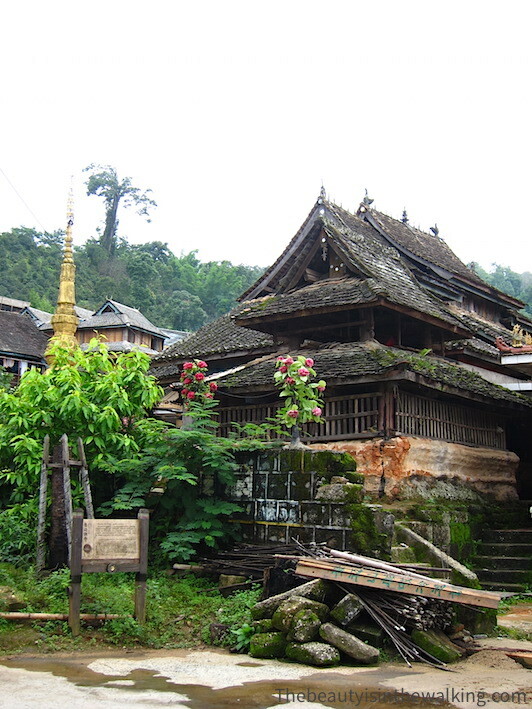 There are two buses a day going to Jing Mai Village. 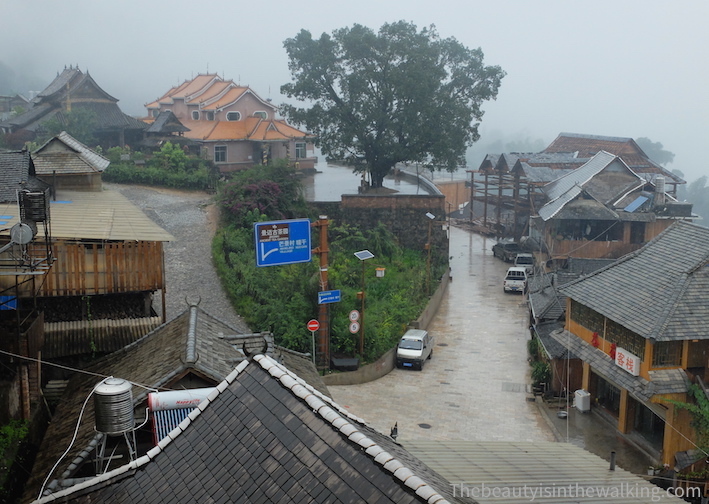 There are several hotels in Hui Min (village located just before entering Jing Mai Shan) where it may be safer to call for reservation during the touristic season. Otherwise, there are also some accommodations in different villages of Jing Main Shan, whose prices and standards highly vary. 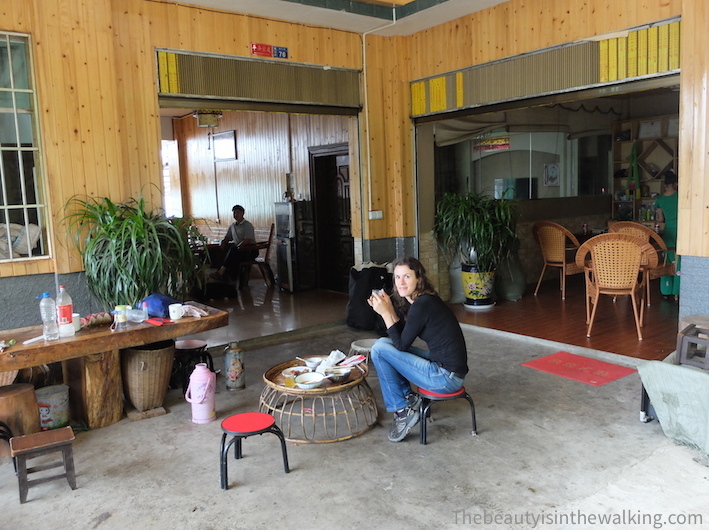 Our hotel, which was located in Meng Bei Village, didn’t have much charm but was clean (a double room without any view, with a bathroom + squat toilets: 120 yuans – approx. 18.9 USD/12.4 GBP). The owners didn’t speak a word of English but were very kind. Even if more and more Chinese tourists come and visit this place, it remains difficult to travel there when one doesn’t speak Chinese and know about the place. It becomes even more complicated to move to different villages, especially as apart from the two regular buses per day, hitchhiking and walking, there is no other way to explore the mountain. If we decide to go back there, we will seriously think of renting a car+driver (Note that we can’t drive with an International driving licence in China) to move around more easily and be able to visit other villages, which are sometimes far from each other and also reach some viewpoints. Give our Facebook page a like to get the latest posts!